Successfully Added Xiaomi Mi Pad 2 Android Tablet - 7.9 Inch Display, Quad-Core CPU, 64GB Memory, 6190mAh, Dual-Band Wi-Fi, 2GB RAM (Gold) to your Shopping Cart. With a thickness of barely 6.9mm the Xiaomi Mi Pad 2 features and ultra slim design that is thinner and lighter than the majority of comparable products out there. Covered in an all aluminum casing this 7.9 Inch Android tablet features an attractive and sleek exterior that is a true feast to the eye. Not just beautiful, the design of this Chinese tablet is also extremely durable making it capable to deal with the harsh environments of everyday life without you needing to worry about the well-being of your Android device. 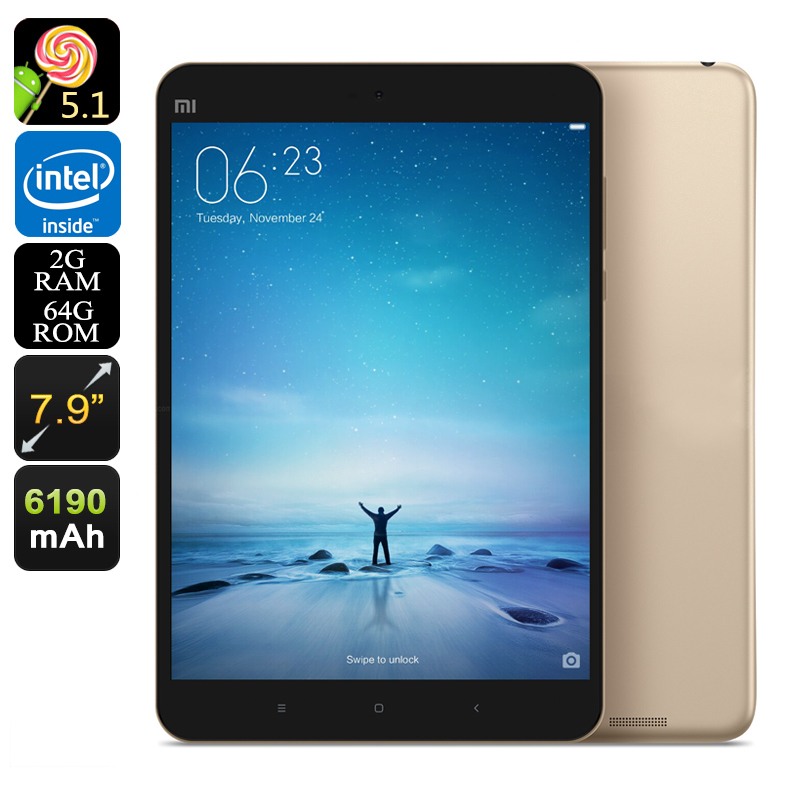 In order to keep up with the latest technology Xiaomi has equipped its Mi Pad 2 with a powerful Quad-Core Intel Atom X5-Z8500 CPU that has been clocked at a stunning 2.2GHz. Backed up by 2GB of RAM and an Intel HD Graphic’s Card this Android tablet lets you enjoy a smooth and energy efficient user experience even when dealing with the most demanding of games and Apps out there. Load the latest games in a fraction of a second and enjoy the most demanding media files without experiencing any lag. With its powerful hardware this 7.9 Inch tablet can handle multi-tasking without dropping a single frame. A built-in Dual-Band Wi-Fi antenna lets you enjoy the fastest data speeds out there. Download files in the blink of an eye and stream online movies in lightning speeds. With the Xiaomi Mi Pad 2 a laggy internet connection will be an issue of the past. Holding a massive 6190mAh battery you will be able to browse the web and enjoy all your favorite features that this tablet has to offer for up to 12 hours in a row without needing to worry about battery life. No matter where you’re headed, with 64GB of internal storage the Xiaomi Mi Pad 2 is able to hold days worth of fun - guaranteeing that, with this Android tablet at your side, all your upcoming road trips will be filled with fun and mobile entertainment. Its 7.9 inch display features a stunning 2048x1536 resolution which is 1.5 times more than 1080p. With such a display at hand, this tablet PC truly brings your media to life. Enjoy a true cinematic experience no matter where you’re headed; with the Mi Pad 2 you will be able to watch all your media in mesmerizing quality and detail. Its 8mp camera additionally lets you shoot stunning footage and pictures yourself, allowing you to capture and share all those special moments in life on a beautiful 7.9 inch FHD display with all your loved ones. The Xiaomi Mi Pad 2 comes with a 12 months warranty, brought to you by the leader in Android tablets as well as wholesale electronic gadgets..